The MSR Hubba is a lightweight 3-season tent that weighs less than 3 pounds (1.4 kg) and is perfectly suited for backpacking, bicycle touring and just about any outdoor adventure where a quick, easy to set up and reliable shelter is needed. For the last 7 months I have been using the MSR Hubba as my primary home while traveling by bike across both eastern and western Europe. From the frozen shores of Iceland to the hot desert landscapes found in northern Turkey, the MSR Hubba tent has kept me warm, dry and comfortable in a multitude of weather conditions. In this article I will share with you some of the tent’s basic features, such as its weight, shape, design characteristics, etc. After that, I’ll tell you about the tent’s major benefits… and its flaws. Finally, I’ll conclude this review with a grab-bag of photos of the MSR Hubba tent in use in a wide range of outdoor environments. If you are looking for an amazingly light, well-constructed 1-person, 3-season tent, the MSR Hubba from Cascade Designs might be just what you’ve been looking for! The MSR Hubba (not to be confused with the MSR Hubba Hubba, which is a two-person tent designed by the same company) is one of the lightest one-man tents on the market. Weighing in at a minimal 2 lbs. 13 oz. (1.29 kg) and a more realistic 3 lbs 4 oz under regular conditions, the lightweight characteristics of this tent make it perfect for bicycle touring, backpacking, motorcycle touring or any kind of outdoor activity where both size and weight are a major concern. The weight of the tent does increase a little once you add a protective ground-cloth, but even with that small amount of extra weight, the tent is still remarkably light. In its stuff sack, the MSR Hubba measures approximately 20 inches long (51 cm) with a diameter of about 6 inches (15 cm) on either side. If you were to remove the tent poles from the fabric body of the tent (as I have done while bicycle touring around Europe for the last 7 months) and were to store the poles separately from the rest of the tent, the Hubba packs down to an even smaller size of about 14 x 6 x 6 inches (36 x 15 x 15 cm). The MSR Hubba is made in Taiwan and constructed from a variety of lightweight fabrics that are common in the outdoor industries. The floor of the tent (the area most susceptible to damage) is made out of 40D ripstop nylon. This makes the floor of the tent extremely lightweight, but also capable of handling a small amount of abuse. However, using a large sheet of plastic (as I have done) or the matching MSR Hubba groundcloth that is available from the company is recommended to keep your tent floor free of holes and tears. The floor of the MSR Hubba is small, but the upper portion of the tent is large, lightweight and transparent, due to the fact that the screen-like material is constructed from 20D nylon no-see-um mesh. This material allows air to easily flow through your tent, which not only helps to cool the tent in warm conditions, but prevents large amounts of water from pooling on the fly of the tent when used overnight. If you’ve ever used a tent and woken up dripping with condensation, you know how important it is to have a tent that allows air to easily pass through it. Due to the mesh material used in the main body of the Hubba’s construction, condensation is rarely a concern. The Hubba is held up with one large, but lightweight interconnected pole system. Folded up, these poles measure about 20 inches (51 cm in length), but when snapped together are more than 9 feet (2.8 meters long). This long and easy to construct pole system is what is used to create the free-standing roof of the MSR Hubba tent. Watch the video below to see how the tent is constructed. In this video they are using the MSR Hubba Hubba, which is the two-person version of the Hubba discussed in this review. However, the construction of the tent is exactly the same. Only the size of the tent and the length of the poles in the video are much greater than those used in the 1-person Hubba. The tent’s exterior rain-fly, which comes in a beautiful light green color, weighs approximately 1 lbs 2 oz and is constructed from 40D ripstop nylon with a 1500mm protective later of polyurethane & silicone, which helps you stay dry in wet weather and prevents the fabric from falling apart in hot and sunny conditions. The tent’s rain-fly gives you access to the Hubba’s single door. The fly can be staked down to the ground and sealed completely shut to keep you warm and dry in wet conditions, or one or both sides of the rain-fly can be pinned back as to allow excess airflow into the tent’s interior. The Hubba’s rain-fly not only functions as your main source of protection from the elements and your one and only access point into the tent’s interior, but when staked to the ground, it also creates a medium-sized vestibule where your shoes or gear can be stowed overnight. There is one large door on the Hubba that allows access to the interior of the tent. The large, single-zippered door is, like the main body of the tent, constructed of 20D nylon no-see-um mesh and can be pinned back and held in place just like the flaps of the rain-fly. The zipper on the door of the tent can be opened from the top or the bottom, allowing for a number of different in, out and half-way open possibilities. Inside the tent there are two small pockets on the rear wall, where lightweight items can be stowed and easily accessed during the night. On top of the tent, there is a small flat canopy area constructed of white 40D ripstop nylon, which serves as the roof of your tent and functions as a great place to store a lightweight solar panel or flash light. This flat area can also be used to hang and dry an article of wet clothing. Besides the obvious light weight of the MRS Hubba, there are a number of other noticeable benefits to this tent. This allows you to pitch whichever arrangement you please depending on the environment and weather conditions you find yourself in. Secondly, the MSR Hubba is a small 1-man tent, but it is large enough to sit up in and remain comfortable. I am a tall 6 foot 1 inch man and I’ve had trouble with tents in the past that were simply too small for me. The Hubba isn’t like those other tents. While the pack-size of the Hubba is small and the carrying weight is light, the tent feels spacious and comfortable. It would be easy to spend several days or even weeks at a time sleeping inside the MSR Hubba. Third, the tent’s rectangular floor design allows you to use the foot of the tent as the head, if need be… or to switch it around and use the head as the foot. This is a small, but note-worthy benefit to the MSR Hubba because it allows you to set the tent up in a manner that is best suited to the wind, weather and slope of the environment you find yourself camping in. If you want to flip the door around to face in the other direction and still sleep with your head facing uphill, you can do that with the MSR Hubba. Other tents are not so easy to flip around and manipulate to your liking. Lastly, the Hubba is large enough to accommodate not just your own body, but a small amount of excess gear as well. While there isn’t much room inside the tent to store a large backpack or a big set of bicycle panniers, there is enough room in the tent itself and under the tent’s rain-fly to store whatever items you might need to store for the evening. Over the course of the last seven months, for example, I have usually slept with the two large rear panniers on my bicycle stored inside the tent with me (down by my feet), while my smaller front panniers are kept under the canopy of my rain-fly near the front door. My handlebar bag, tripod and whatever other items I might have with me, easily fit in the small thin space at the side of my sleeping mat. There are three noteworthy drawbacks to the MSR Hubba. First of all, the space inside the tent for excess gear isn’t extremely large and while I found the storage space to be more than enough (once I got used to the tent and learned how and where to store my gear), I fear that some campers may feel a bit squished when they climb inside the Hubba for the first time with all of their belongings. Secondly, the large zipper on the tent’s main door has given me some problems. Like other MSR tent’s I have owned in the past, the zipper on my MSR Hubba has showed signed of deterioration and I’m afraid that over time the zipper may stop functioning entirely. After 7 months, the zipper is still going strong, but there have been multiple times when the zipper has slipped off its track, got stuck in the mesh material or generally given me problems. So be careful with that main zipper. Treat it well and make it last for as long as you can. Finally, the length of the poles when in their folded position is worth noting. At 20 inches (51 cm) long, the poles are simply too long to fit inside any of my bicycle’s panniers. This means that either the tent as a whole or simply the poles themselves need to be stored outside of your panniers, which is something I generally try and avoid. I would prefer it if my tent and its poles fit comfortably inside on of my bicycle’s rear panniers. That way I could keep the tent both dry and protected from the sun as I traveled about. Instead, the length of the poles has forced me to carry the poles separately from the tent. I removed the poles from the tent and stored them on the rear rack of my bicycle, while the main body of the tent is stored inside one of my bicycle’s rear panniers, along with my sleeping mat and sleeping bag. If the poles were just a couple inches shorter, the poles would fit inside the rear pannier and I would be able to keep all the parts of my tent together in one place. Unfortunately, the way the tent poles are currently designed, this set up isn’t entirely possible. Would I Recommend The MSR Hubba Tent? Overall, the MSR Hubba is an amazing one-man tent that I would whole-heartily recommend. It may be one of the higher-priced one-man tents on the market, but I believe it is worth every cent. After camping in this tent for the last seven months in a multitude of locations and weather conditions, I can truly say that the MSR Hubba is very likely one of the best bicycle touring tents on the planet. This entry was posted in Bicycle Touring Pro Articles, Featured Articles, Main Articles, Product & Service Reviews, Products, Tents and tagged 1 person tent, best bicycle touring tent, best one person tent, bicycle touring tent, hubba review, hubba tent review, msr hubba, msr hubba hubba, msr hubba tent review, msr one person tent, msr tents, one person tent, one person tent reviews, tent reviews. Thanks for the review. I have the same tent, recently bought, and have used it a few times already. I researched the kind of tent to get for cycle touring, and most reviews pointed towards this tent. I realised this morning (before I read your review) how long those poles are, and how I can’t pack the tent into my panniers, but thanks for the tip of strapping the poles separate from the tent sack (albeit an incomplete solution). Thanks also for the tip on the main zip. I will be sure to treat it carefully! I’m looking forward to more adventures with my tent! I have the MSR Hubba Hubba, the 2-man version of this tent, which I used on a solo cycle trip last summer for the first time and found that it fit my needs perfectly. There was lots of room inside to store all 4 of my panniers and it felt spacious. I could easily get dressed and undressed inside the tent without being a contortionist – something other tents seem to require. Yes, I had to store the poles outside of my panniers along my back rack, but I simply stored them in a dry sac, which was also a handy spot for carrying my Swedish “Walkstool” and any other odds and ends along the way. I have the MSR Hubba Hubba. I use it as a one person tent. As stated, the Hubba is a little tight. The Hubba Hubba has plenty of room, I can store my paniers inside if needed. It also has vestibules on both sides, as well as access,. also nicer for storage. The weight is only about 1.5 lbs more, but you go from 17 sq.ft. to 29 sq.ft floor space. I used the Hubba Hubba on a 34 day tour from Vancouver back to Thousand Oaks, down the Pacific Coast. I carried the entire tent and MSR ground protection in a dry sack that I attached with a bungie to the rear rack. This was also a good/soft/protected place to carry my solar charger. Excellent construction, easy set-up. One or two person MSR, you won’t be disapointed. Thank you for the review. A tent for the traveling cyclist is always an inconvenience to carry … too large and bulky and never light enough. When pitched at the campsite, its never large enough, dry enough or wind proof enough. The need to have ventilation to keep cool in the heat and yet dead air to keep warm in the cold all the time while needing air flow to keep dry is always a challenge. My experience with touring generally has had me carrying a larger tent to keep my gear inside the tent. I like keeping things secure, dry and at an arm’s reach. I also like to be able to get things back in a state of being ready to ride tomorrow in the dry confines of my tent … if necessary. After experiencing a bad day or several bad days of weather it sometimes becomes necessary be able to reset your condition all within the confines of the tent. I have accepted the additional bulk of a lager tent to do this. Another option is to have multiple riders carrying different types of tents. I did one tour where two cyclists carried two different tents…. one a mesh tent much like you describe and one a four season tent that kept us warm while enduring wind rain and snow. As always investing in quality equipment is a far wiser approach than skimping on less than reasonable equipment. A real good treatment for zippers that get a lot of outdoor use is to run over the teeth with a bar of Ivory soap. Some may tell you that an old candle will do the trick, but I have heard from some sources that cheaper candles have petroleum based ingredients that can harm the tent’s nylon. I do wish the MSR had a sturdier zipper, but until then, try this method. You’ll be amazed at the difference in performance. Thanks for your review. I bought a Hubba about a year ago after extensive research (and reading your blog!) I have used it on three bike trips and four backpacking trips. I fit all of my Ortlieb panniers (5) in the vestibule and still had room to get in and out of the tent. It has held up GREAT so far, of course I’ve only done 19 nights with MY trips! One night was on 4″ of snow and 29 degrees last week. When is your winter touring book coming out? One more thing. I just bought the MSR HOOP for more winter gear room (it was on sale for $199) and for the odd occasions I have another person camping with me. I will be using it on a backpack trip in two weeks. Have you ever tried this tent? Thanks for the great review. I am both a walker and a cyclist, and have long considered the MSR Hubba or the two man Hubba Hubba. I would probably go for the two person Hubba Hubba for cycle touring but it is a bit much for backpacking. I have just noticed that the MSR web site shows that there is a Hubba Gear Shed available. The Gear Shed is a side extension for either the Hubba or Hubba Hubba. So … the MSR Hubba alone could be ideal for walking or as a light weight cycle touring, and with the Gear Shed would give an extra 2.5 sq m for storage if required ! It weighs only 887grams too! Might be the ideal solution! have the MSR Huba from several year. The only drawbacks that i found is in the top layer. In my opinion it should arrive to the floor to avoid wind and rain entrance. In many tends this is aspect is often present ( e.g. https://www.ferrino.it/en/homepage/products/TENTS/high_lab_114/expe_ss12_ ). Moreover also some little “windows” on the top will allow a better ventilation avoiding internal condensation (in the same link see the black window). Those aspect will increment the weight of few grams but will give to the tend the a “winter season aspect”. May be you should point to MSR company. Enjoyed the article and pics of the 1 man Hubba tent. Darren, I agree with you! The MSR Hubba is a great tent. I use the Hubba Hubba, it is worth it to me to have the extra room for the weight increase. If I get nailed down in a storm it’s nice to have the room and not feel like a sardine. The garage is also nice for car camping. Great place to cook if need be. Also suggest that you look at Tuba racks. They are bomb- proof! After looking at both the Hubba and Hubba Hubba I went with the 2 person version for the greater interior space and dual vestibules for a small weight penalty. Tent, poles, footprint and sleeping pad all fit in a Sea to Summit dry sack and strap nicely to the rear rack leaving more space in the panniers for things that need the extra protection. Yep we love the Hubba Hubba 2 man! We are currently bicycle touring in Mexico and it’s been great for the coast and the mountains but when we hit Oaxaca it was too hot to sleep in. We also carry with us 2 jungle hammocks. They are an amazing addition to a long tour if you don’t mind the extra weight! I can appreiciate the cramped feeling that a one person tent can invoke, but what I don’t understand is why remove all the panniers from the bike and store them in the tent in the first place? I have a camoflage poncho that doubles as a tarp I use to cover the bike. The only bags I use in the tent are my handlebar bag (with all the really important stuff) and one pannier that I use a pillow. My tent is Backcontry by Eureka, and though it weights about 5lbs, all of its components can fit neatly into a stuff sack that fits very well within my Arkel T-42’s. I have not had any of the zipper problems mentioned in the review of the MSR Hubba, and after 3 cross country tours over the past 10 years, the tent is still going strong. Some people do prefer to leave their panniers on the bike at night. I, however, like to have my belongings inside my tent with me. I sleep better that way, knowing that no one is stealing things out of my panniers while I sleep. I persnally use a Nemo GoGo bewy tent that has an inflatable pole system. On top of cycling, I also hyke and do walking trips, so for me the size and weight is very important. I walked the St-James way 1000 KM in France and Spain carrying it in my packsak with everything else I needed for the self supported walk. This is an excellent review. I ended up buying the MSR Hubba partly based on this review. Used it on a four-night canoeing/camping trip and it was excellent, even after a crazy gust of strong wind (the ones you can hear roaring towards you in the treetops). I ended up making my own “mud” ground mat, cut from an old tent fly, which took 15 minutes to make on a sewing machine. It has a reflective silver layer on one side, so it might help keep the ground a little warmer. It made a big difference to the comfort of getting in out of the tent when the ground was wet or muddy. Highly recommend it. An old nylon shower curtain might also be an option. I love my Hubba Hubba! I use it as a one-woman tent, usually for hiking as it is the lightest tent with great comfort! I’ve had it for a few years now and it is a home from home. I like that I can use it in different ways, especially here in the Australian heat and sometimes, it’s just a fly screen and I can watch the stars! Great review, thank you! Nice article. Just wondering how well you got on with the Hubba in Iceland. Was the mesh interior a problem at all? I’m travelling to Iceland for 2 weeks at the end of August and plan to camp for the majority of the time. I’ll be camping at/near many of the places you did when you were there. I’m just deciding which tent to buy, it’s between the Hubba and the Salewa Micra 2. I’ve found both at great prices. The Hubba is the lightest (approx 1kg lighter) which is a big bonus as I’ll be using public transport and hiking (nothing against bikes though!) but I have some doubts about the mesh and whether it will keep me warm enough. Did it give you any issues? The Hubba worked great in Iceland, but because it was so windy, I had to be smart about where I set up my tent. I wasn’t just pitching the tent directly in the windy. I was usually on the lookout for a shelter of some kind to hide the tent behind – a rock, a building, a little mound in the earth, etc. As long as I did that, I was pretty well protected inside the Hubba. There was one night, I remember, when I thought it would be a good idea to pitch my tent on this elevated platform behind a small public toilet. The tent was on the side that was protected from the wind, so it would have been perfect. 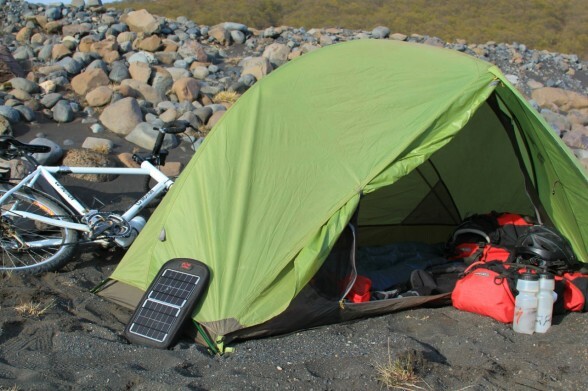 See here: http://bicycletouringpro.com/wp-content/uploads/2012/11/iceland-shelter-campground-660×439.jpg But the problem was that the wind blew directly under the elevated structure and then blew from the ground up into my tent. That night was super cold… and I probably would have been better off just pitching my tent in the grass behind the structure. I’ve just bought an MSR Hubba NX Green. I’ve already a similar to a HubbaHubba, the Luxeoutdoor Habitat, it’s a clown of the HH, but i think the quality is not the same. And I suppose will not be suitable for cold and windy. I like to have a bit room for my gears, into the tent, and is for that I decided at first to buy a Habitat, but now I’m preparing to colder trips and I think MSR Hubba nx its perfect. Thanks you Darren for your review. So what happens if your riding in the rain, get to your campsite and have to put up the tent in the rain? The interior gets soaked. The pole system is complex as well. Tents like this are fine when the weather is nice, but not so great when its really needed. There are better alternatives. Look into the mountain laural designs trailstar with the inner bug screen, or zpacks mids and altaplex and duo plex tents. These are more bomb proof tents that are light weight, capable and strong. The downside of course is cost, but would more than make up for it in the first bad weather night. Go lite made fine tents as well, but is now out of business. Henry Shires tarp tents are great as well, letting you set up a tent in the pouring rain without getting the inside wet. The other option of course is to hang a hammock, like the warbonnet outdoors blackbird and a lightweight tarp, but you need trees for that and they may not always be available. But with that setup not only will you be dry but so will your gear and bike even with a big enough tarp. Many like the hilleberg tents, and they are great but expensive and somewhat heavy. A shelter is just that, shelter from the storm. And that should be the first priority in choosing one. What will be the most comfortable, and safe shelter in the event of a heavy storm, or high winds. That protects you and your gear. It could save your life. Also, site selection and knowledge of how to set the tent up in various conditions is important. Looks a good tent. I use a lighter two-person tent myself which is around 800gram, which I believe is ‘the’ or ‘one of’ the lightest in the world. I find it very good, although a little tight on putting all the bike panners underneath and/or in the tent, in spite of being two-person, but I enjoy the weight saving.